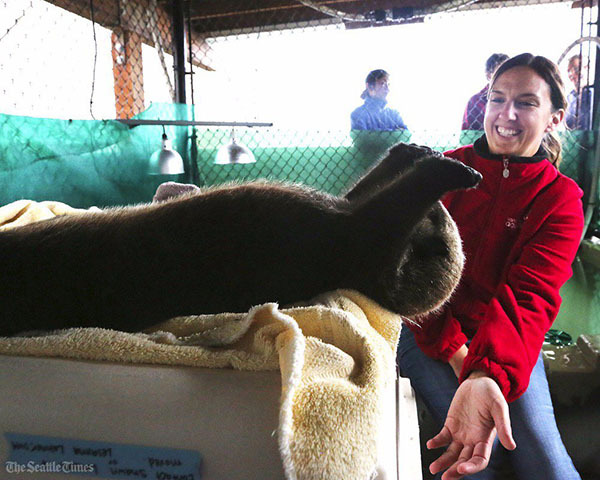 Remember Rialto, the tiny sea otter pup rescued only last month in Washington State? After spending some time recuperating at Seattle Aquarium, he's now emigrated to Canada and will be living at Vancouver Aquarium. And look how much he's grown! Once they arrived at the aquarium, Kristi Heffron, senior marine-mammal trainer there, took Rialto from his cage and cradled him in her arms to walk him into his new nursery, and gently put him right into a wading pool of saltwater. Rialto instantly quieted, and swished around like it was just where he belonged, shaking off the trip as if it had never happened. His nursery adjoins the quarters of the aquarium’s other otters. He can see them, and they can even touch noses through holes in the clear Plexiglass door between their quarters. But it’s not time to introduce him just yet. In a few days or weeks, depending on how things go, Rialto will have access to the large saltwater pool when the other otters are out of it. And eventually, there will be introductions to his new otter family. But for now, the idea is to let him rest up, gain weight and settle in, using his baby pool for fun. The nursery also includes a crib with water-bed mattress, a grooming table, and something the public will love: a webcam, to follow his doings. It will surely be impossible for Seattle Aquarium not to miss this little guy, but unfortunately, they did not have room to keep another male sea otter through adulthood. Vancouver Aquarium happened to be next in line to take in a needy otter, so Rialto will be within visiting distance for any Seattleites who miss him!